HOW TO CHOOSE FURNITURE manufacturer? Furniture purchasing is a difficult and sometimes tiresome process which is to some people is an investment. Integrity and completeness of your interior and your personal well being will depend on success of this purchase. So how to choose furniture properly? For starters, it is necessary to decide how you see the interior of your house. Nowadays we have wide range of furniture factories that allow to satisfy requirements of the most experienced buyers. The choice of a furniture factory depends on many things, for instance many manufacturers have the specialization, its advantages and negative sides. All furniture manufacturers are trying to win customers by trying to offer all kinds of furniture. «MOLODECHNOMEBEL» has a number of advantages over other furniture manufacturers. We have wide assortment of various kinds of furniture, retail stores provide top class furniture across all Belarus and abroad. Designs of furniture manufacturer, MOLODECHNOMEBEL, are marvelous and win hearts of wide audiences. All you need to listen and listen, when choosing furniture manufacturer is the heart only. Among all furniture manufacturers of Belarus JSC MOLODECHNOMEBEL by right takes the place at top, completely justifying the statement that furniture can be well done in Molodechno. If you need reasons, your wish is a law for us! The furniture manufacturer «MOLODECHNOMEBEL» has more than 50 years of history in the asset. Having begun the activity in the 1950th years, we reached successes in many respects, having united Molodechnensky and Vileysky furniture factories and having won recognition of buyers not only in Belarus, but also abroad. 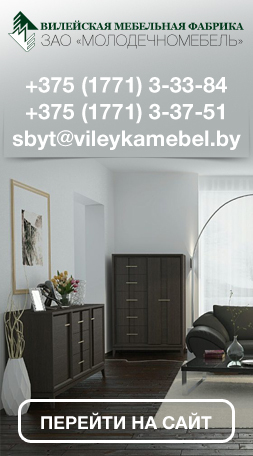 Today «MOLODECHNOMEBEL» is recognized brand among furniture manufactueres of Belarus, business that proved to be reliable. Production of JSC MOLODECHNOMEBEL is noted by numerous diplomas of various Belarusian and international exhibitions for design, high quality, wide production range, high production technology level. Production of the furniture manufacturer is based on modern technologies, is certified and meets requirements of MS of ISO of a series 9000 of version 2000. The ecology question always was essential for Belarus. That is why the furniture manufacturer «MOLODECHNOMEBEL» prefers only natural, non-polluting materials. The entire line of our furniture manufacturer is made of natural wood and skin, glues and structures that are being carefully controlled in productions process. JSC MOLODECHNOMEBEL earns customers due to its huge variety of sleeping sets, sets of cabinet furniture, dining rooms, halls, cabinetry, show-windows, curbstones and dressers are more than 500 models and modifications. Our design combines majesty of classical traditions and functionality of current trends. And leather sofas and chairs by right deserved a rank of elite furniture. All these years in business helped «MOLODECHNOMEBEL» to improve production technologies, widen the range of furniture offered, optimize price policy and nowadays the furniture manufacturer provides customers with great products increasing client base progressively every year. We have built furniture for many international customers from US, Europe with the goal of providing comfort and elegance to their homes. Our retail shops all across Belarus, partners network in Moscow, Russia, Netherlands, Belgium offer top notch elite furniture made of natural materials tested and certified by international certification institutions, recognized world wide. For additional information on luxury furniture call: +375 176 73-01-75 or contact us by e-mail: Sadovsky_VM@molodechnomebel.by. Furniture Manufacturer «MOLODECHNOMEBEL» — elegance and comfort for you and your house. The promotion is valid in the company network JSC "Molodechnomebel"
Attention Photos can not transmit the exact color of the furniture. The manufacturer reserves the right to change shown in this catalog pieces of furniture without notice. All the information about products and services provided for informational purposes only and is not a public offer and a base for reclamations. Reception: +375 176 58 05 88 тел. Sales department: +375 176 73 01 75 тел.